Cookiecon 2017! My first time attending was the prior Cookiecon and now I’m hooked! I’ll be attending in March 8-11, 2017 again as a Pre-CookieCon instructor and as a vendor. If you are interested in taking any of my classes, class registration is completed here and through paypal, and not through CookieCon. Registration now open. Fondant is a very versatile decorating media! In this hands on class, we’ll explore some of my favorite techniques to create elegant cookies. We’ll use various tools and molds to create lovely textures and designs. We’ll cover some lace effects such as brush embroidery, plaques, and ruffles. Finally, we’ll create an adorable mini cookie bouquet. A little scared of fondant taste? We’ll be sampling, and the results are delicious! All of the supplies are included. You’ll complete at least a half dozen decorated cookies. $110, limited to 15 students. In this hands-on class we will be using lots of different media to achieve shimmer and sparkle. Learn what is edible and what is not edible for use on cookies. Then put these edible shimmers to use while we decorate some fabulous Easter egg cookies using rolled fondant, frosting sheets, and royal icing. We’ll be using metallic and pearl sprays, dusts, paint, and more. All of the supplies are included. You’ll complete at least a half dozen decorated cookies. $110, limited to 15 students. Learn how to decorate using buttercream. Pipe fabulous cookie that taste amazing! We’ll be piping ruffles, flowers, and much more. All of the supplies are included. You’ll complete at least a half dozen decorated cookies. $110, limited to 15 students. Cancellation Policy: Please cancel before February 1, 2017 to be issued a $100 refund (a $10.00 service fee is deducted as paypal charges me for every transaction). No refunds will be issued after February 1, 2017. In the unlikely event there is an emergency and I need to cancel, a full refund will be issued. Do you have a question, or would you like more information? Email me at autumncarpenter@hotmail.com. Please do not request to sign up for the classes through this email. Use the form above. Fondant isn’t just for cakes. To be honest, I don’t love the taste/texture of fondant on cakes; but on cookies, it is a delightful sweet compliment, as well as a very practical decorating method! In this hands-on class we’ll start by tasting cookies using several different brands of fondant (and candy clay). Next, we’ll use various tools and techniques for fun textures, sculpting techniques, and edible frosting sheets. Finally we’ll create fondant pieces to create adorable accents. All of the supplies are included. You’ll complete at least a half dozen decorated cookies and a mini cookie scene. In this hands-on class we will be using lots of different media to achieve shimmer and sparkle. Learn what is edible and what is not edible for use on cookies. Then put these edible shimmers to use while we decorate some fabulous cookies using buttercream, rolled fondant, wafer paper, and royal icing. We’ll be using metallic and pearl sprays, dusts, paint, and more. All of the supplies are included. You’ll complete at least a half dozen decorated cookies. $110, limited to 12 students. FILLED. If you are interesting in being on the wait list in case of a cancellation, please fill out the form below. Fondant is a very versatile decorating media! In this hands on class, we’ll explore some of my favorite techniques to create elegant cookies. We’ll use various tools and molds to create lovely textures and designs. We’ll cover some lace effects such as brush embroidery, eyelet lace, and ruffles. Finally, we’ll create an adorable mini cookie bouquet. All of the supplies are included. You’ll complete at least a half dozen decorated cookies. We’ll also be tasting different brands and types of fondants and edible clays to determine your favorite! 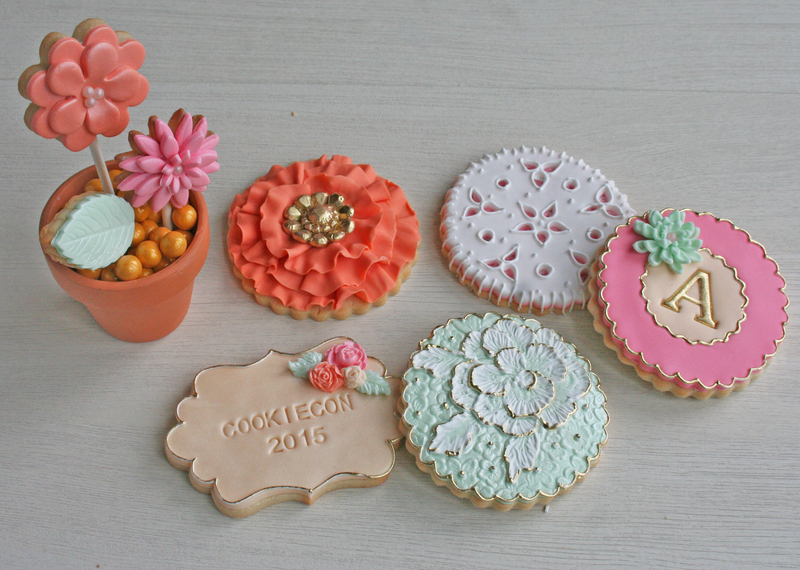 This entry was posted on March 19, 2015, in Autumn's Upcoming Classes and tagged cookie classes, cookiecon, cookies with fondant, decorating cookies. Roll cookie dough. 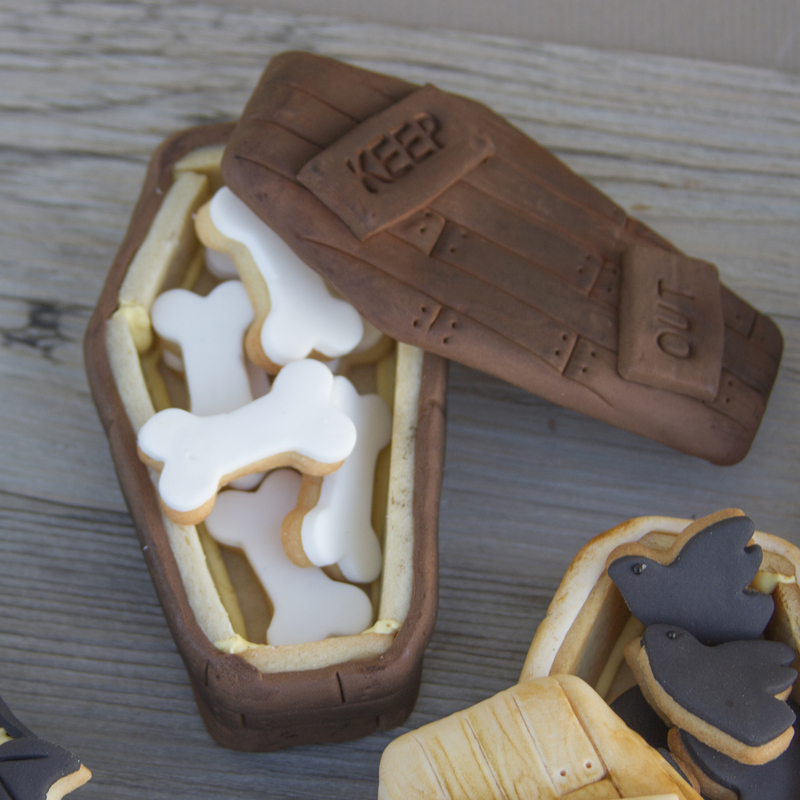 Cut the coffin cookies, using the coffin cutter. You will need two sets from the cutter. Cut the bones, ghost, hands, crows, and bats. Bake and cool the cookies. 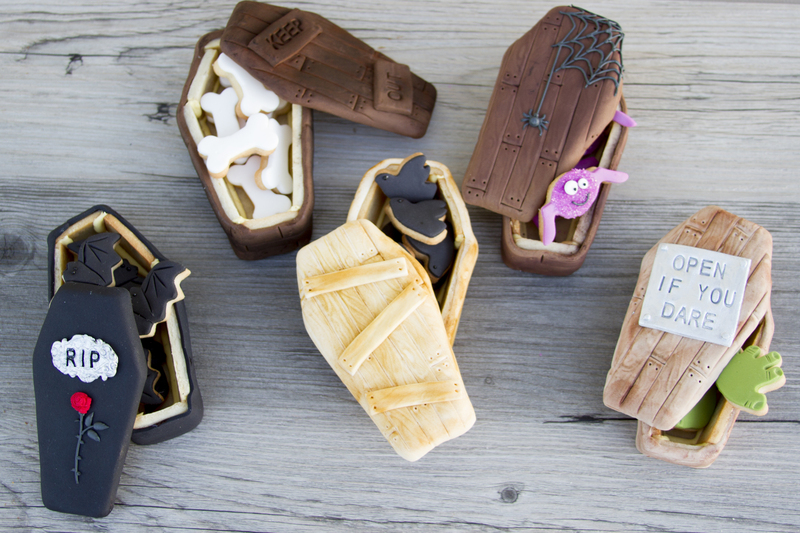 Assemble the coffins using royal icing. Allow the 3-D coffin to dry overnight. Knead and soften fondant for the coffin. Roll the fondant. Texture the fondant with the wood grain texture mat. Brush piping gel on the coffin lid. Cover the lid with the textured fondant. Use the polyblade to trim around the fondant-covered coffin lid. Roll a strip of fondant. Texture with the wood grain texture mat. Cut the strip the height of the sides of the coffin cookie. Brush piping gel around the side of the cookie. Place the strip around the side of the coffin. Add additional dimension on the coffin lid and the side of the coffin using the polyblade to add deeper cuts. Add nail holes using the two in one tool. Cut small pieces to resemble wood pieces. Emboss “Keep Out” on the wood pieces using the letter embossers. 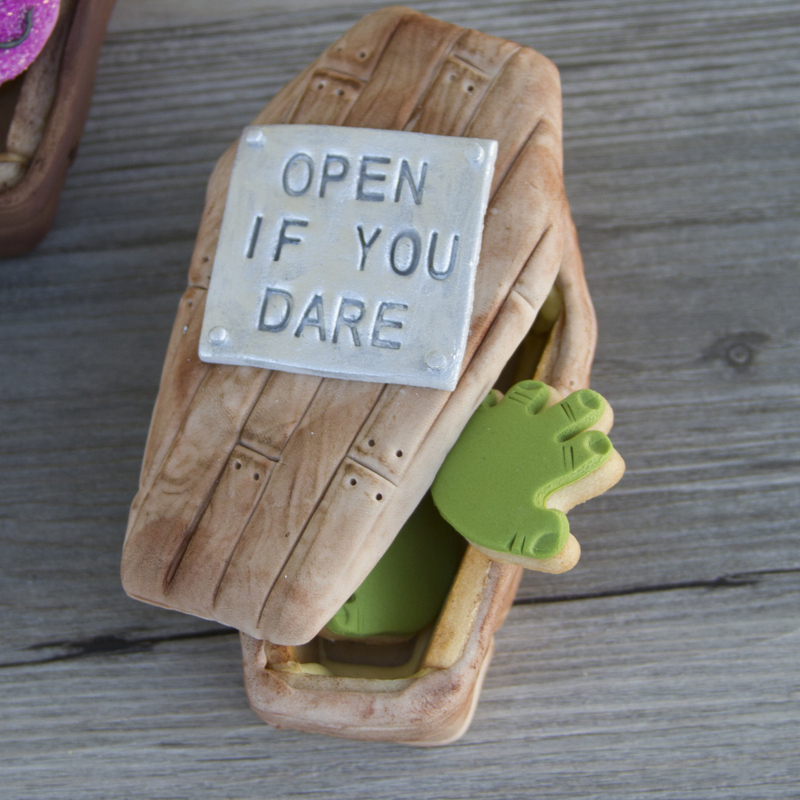 Cut a small square of grey fondant and emboss “Open if you dare” using the letter embossers. Paint the square with silver dust mixed with grain alcohol. Mold the top part of the key using black fondant. Paint the key plaque with silver dust mixed with grain alcohol. Emboss “RIP” on the key plaque using the letter embossers. Mold the rose and attach using piping gel. 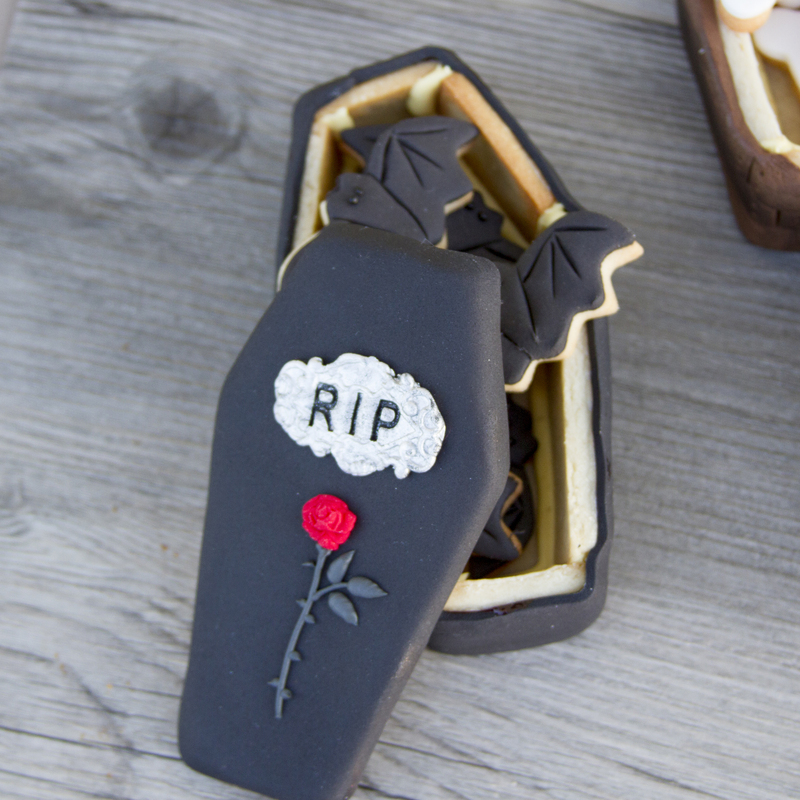 Attach the coffin lid accents using piping gel. Pipe the stem using royal icing and tip #1.5. Pipe a spider web using black royal icing and tip #1.5. Cover the mini cookies with rolled fondant. Emboss the hands using the two in one tool. Emboss the bat using a paring knife. Use non-pariels for the eyes on the bat, ghost, and crow, attaching with piping gel. 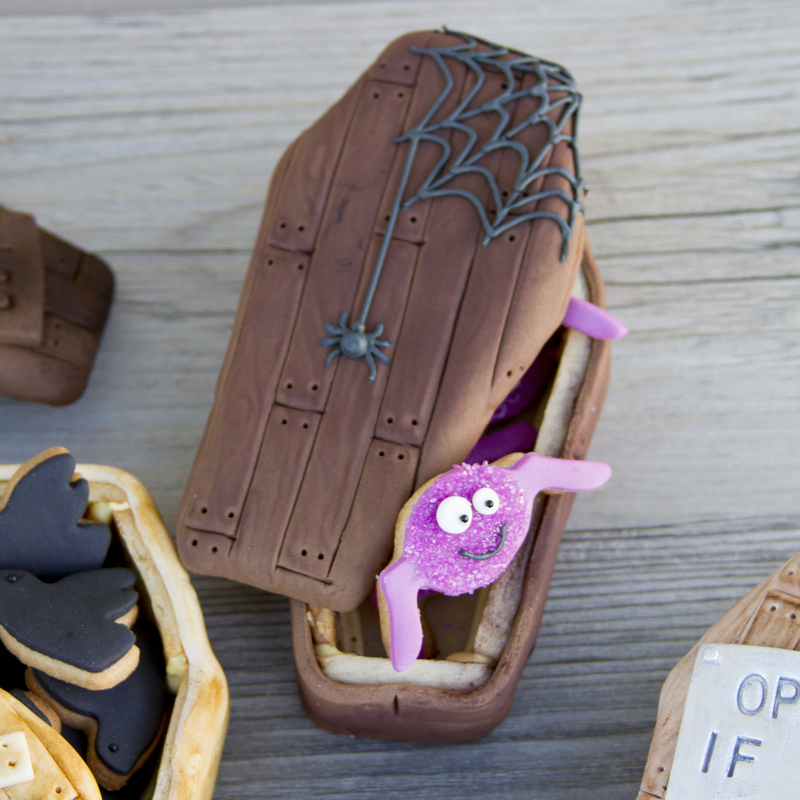 This entry was posted on October 22, 2014, in Halloween and tagged coffin cookies, cookie decorating, decorate cookies, halloween cookies, impression mat, rolled fondant, texture mat, texture sheet. Roll fondant thin and use same cutter used to cut cookies to cut the fondant. Brush cookie with piping gel and attach fondant piece. To make texture piece, roll fondant thin and place over texture mat. Be sure the mat is on the side to give you a raised image. Roll over fondant with even pressure. Flip fondant over and remove mat. Use cutter to cut piece and attach to cookie using piping gel. Use polyblade to remove the beak and feet. Roll orange fondant the same thickness as your bird and use cutter to cut the feet and beak. Use the polyblade to cut feet, wing (only on the paisley textured birds) and beak and replace the feet and beak on the cookie. For plain wings, roll desired fondant color thin and use the bird cutie cutter to cut the wing. Allow wing to dry for several hours. For paisley wings, push desired fondant color into paisley mold then remove with sharp pin or modeling tool. Pipe colored accents using royal icing then allow to dry for several hours. 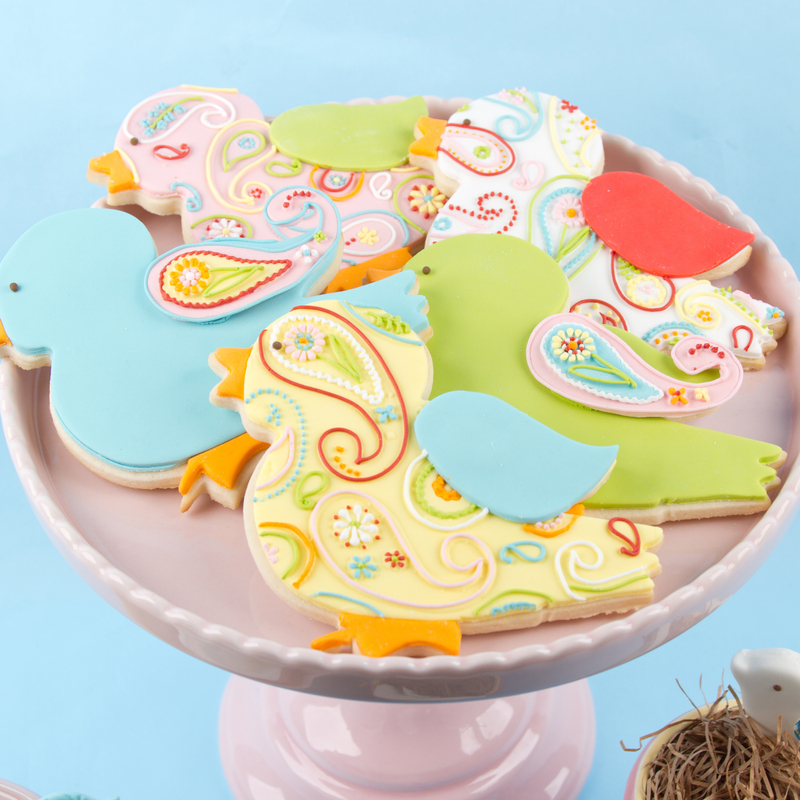 Use royal icing to pipe over paisley textured birds and allow to dry. Attach wings to birds using piping gel and roll tiny balls from brown fondant for the eyes and attach with piping gel. 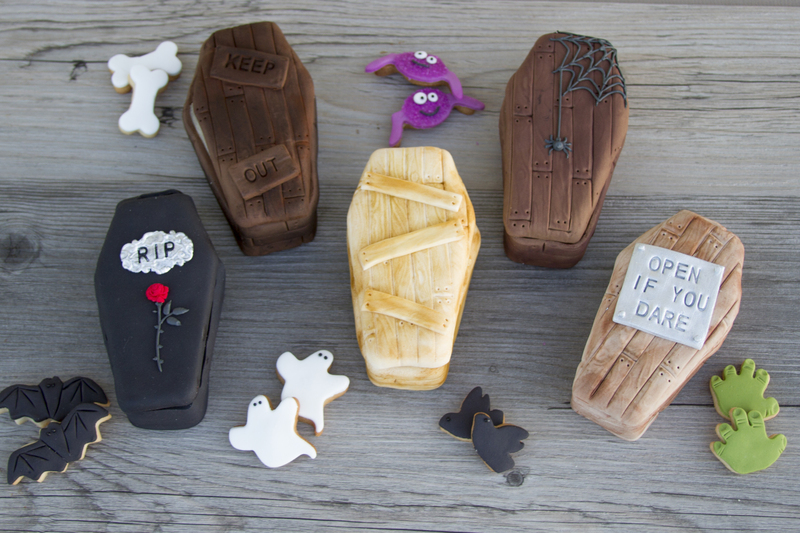 This entry was posted on August 25, 2014, in Fun Theme Decorated Cookies, Rolled Fondant, Royal Icing and tagged cookie, cookie decorating, decorated cookies, decorating, fondant, impression mat, rolled fondant, royal icing. Roll white fondant to 1/4″ thickness, place fondant on Mod Circle texture sheet and roll with heavy pressure. Using the same cutter used to cut the cookies, cut out circles. Brush cookies with piping gel and lay on top of gel. Roll orange and lime green fondant very thin and cut small circles using mini accent cutter. Lay colored circles over the white circles of the cookie. 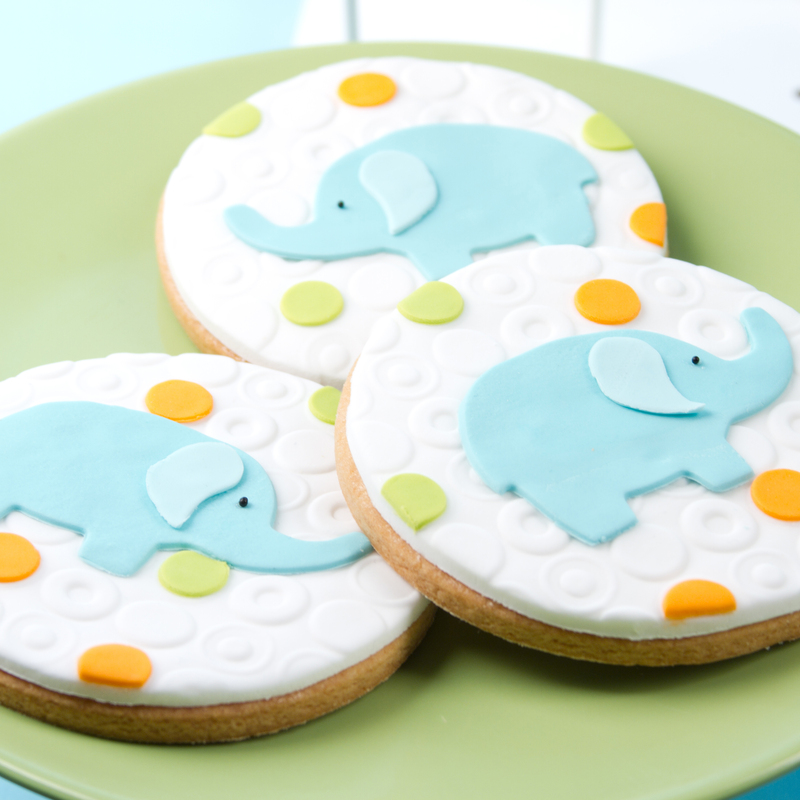 Roll light blue fondant thin and cut elephant; apply to cookie with piping gel. Roll pale blue fondant very thin and cut using largest teardrop shape from accent cutter set. Apply to elephant with piping gel. Add black non-pareil for eye, attaching with piping gel. This entry was posted on August 25, 2014, in Baby Decorated Cookies, Rolled Fondant and tagged baby, baby shower, baby shower cookie, cookie, cookie decorating, decorated cookies, fondant, impression mat, rolled fondant, texture mat. Roll rolled fondant to desired thickness. 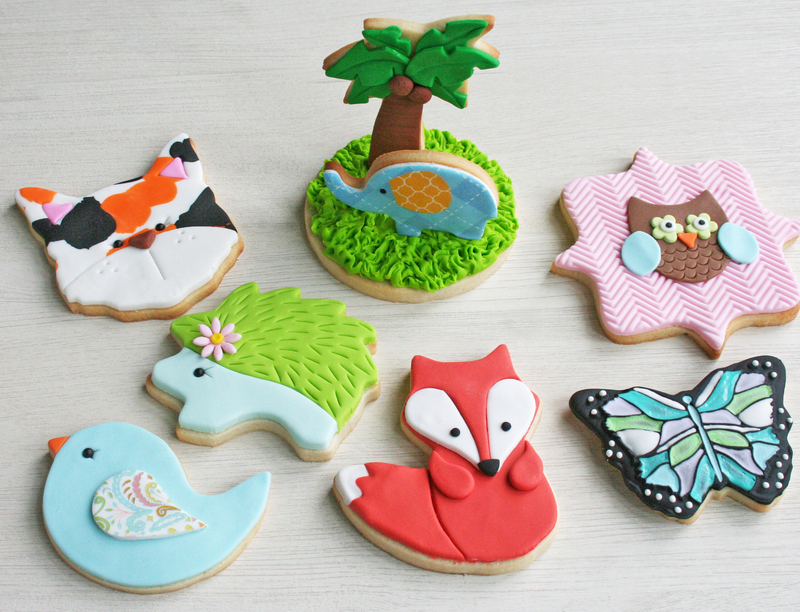 Use texture mats to texture fondant and cut using same cutters used to make cookies. Brush cookies with piping gel and lay fondant on cookies. If pattern is recessed, used edible markers to highlight patterns. Cut flip flop straps using strip cutter. 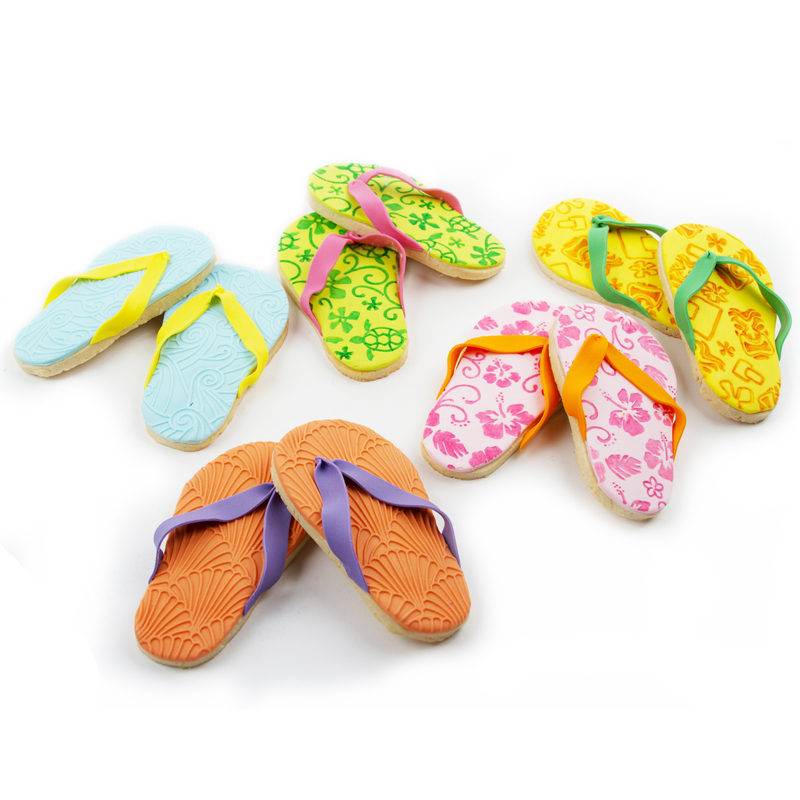 Attach to flip flop using piping gel. Use cotton balls to prop-up straps until dry. This entry was posted on August 25, 2014, in Fun Theme Decorated Cookies, Rolled Fondant and tagged cookie, cookie decorating, decorated cookies, decorating, impression mat, rolled fondant, texture mat. Roll gum paste or fondant very thin. If using a pasta machine, thin to a #3. Cut ladybugs out of both red and black gum paste or fondant. Use poly blade to cut between the head and body of both red and black pieces. Attach the black head to the red body using piping gel. 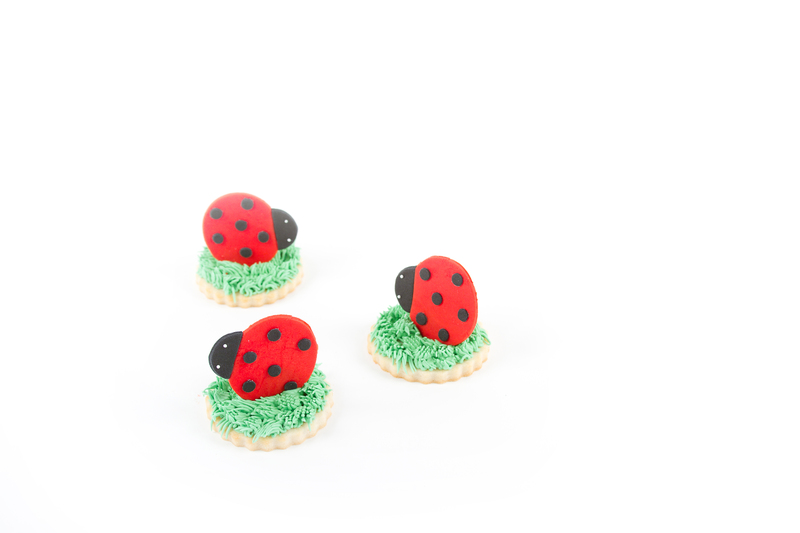 Use the smallest circle accent cutter to cut black dots and attach to ladybug with piping gel. Place two dots of piping gel on the head and place white non-pareils for the eyes. Allow all pieces to harden overnite. Using a pastry bag fitted with the grass tip, pipe grass on top of cookie. Be sure to make the grass a little thicker in the center. Slide hardened ladybug into the center of the cookie. If needed, pipe more grass in the back of the ladybug for support. This entry was posted on August 25, 2014, in Buttercream Icing, Rolled Fondant and tagged baby, cookie, cookie cutter, cookie decorating, decorated cookies, decorating, fondant, spring cookies. Click to be notified via email when new cookies and recipes are posted.